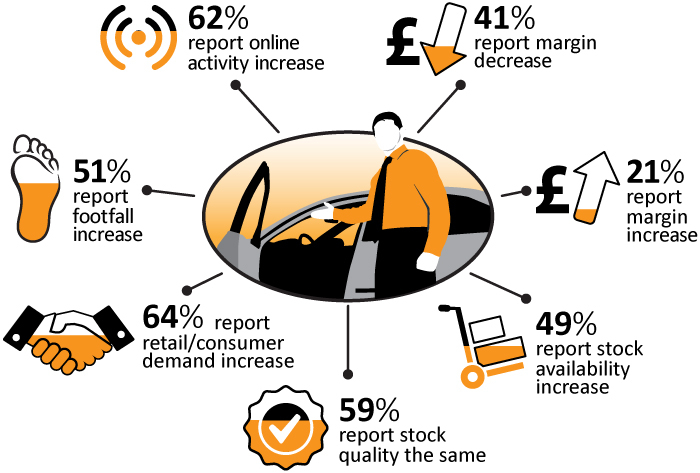 Not quite the return to the 65% seen in January; however, in March 51% of the respondents are reporting an increase in footfall – a jump from the 30% in February – overall 84% of dealers reporting a better or similar picture to last month. As expected, the ever-important online activity is slightly higher than the footfall at 87% reporting that they’ve seen an improvement or equivalence. The concerns around margins being squeezed, increases to 41% saying they are experiencing it, an increase of 7% from the 35% in February. Interestingly, 21% are reporting an increase. The market sentiment, is that this is a mix of many variables such as, preparation costs, purchase costs and increased competitiveness. 49% are experiencing an increase in stock availability, with 34% reporting no change. Remarkably, even with the increase in availability, 59% are commenting that there has been no change in the quality of stock since last month. As previously, trade values remain an interesting question, as its not necessarily related to CAP, nevertheless, this is an equal split between those that believe current trade reflects the market and those who think they are too high. Retail and consumer demand reflect the sentiment around online and footfall activity; with 64% reporting, it has improved since last month; whereas, this figure was only 35% in February. Why has this survey been done? This market survey has been created in response to dealers hankering for a more holistic current sentiment of the questions they ask themselves daily, so they can understand the temperament of the wider market. Respondents cover a very diverse sector of the automotive industry, from the larger franchise groups, supermarkets, independents, single site owner-driven operations, through to auctions and remarketing. The survey is done monthly, within a very small open window. This ensures that the responses are market relevant and current. The data in this survey is for last month (March 2015). If you want to be involved in next month's Dealer Survey – for Dealers, by Dealers - then please contact CAP's Black Book Editor and Retail & Consumer Specialist, Philip Nothard.